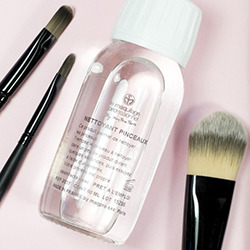 This brush cleaner easily removes even the most stubborn product from your brush, including lipstick.. 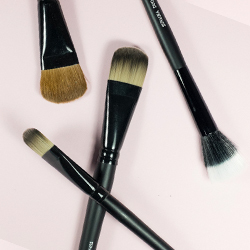 This Brush Set is made up of our two Foundation Brushes. Made with Badglerlon Hair, these Foundation.. Handmade with Super Goat Hair, this Blusher Brush has a round, soft head, ideal for applying blushes.. This Classic Foundation Brush is handmade in Ireland, with excellent hair retention properties. It's.. This Fan Powder Duster Brush is made of the finest White Pony Hair, and is perfect for applying the .. Handmade with the finest synthetic hair-- Badgerlon-- this is a Large Foundation Brush, specially de..
Join the Contouring Craze! 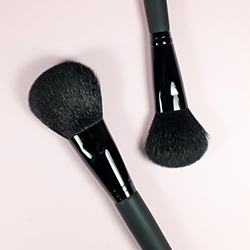 This beautiful Contouring Brush is handmade with Sable Hair. A versatile,..
Made from the highest quality Super Goat Hair, this brush is designed to apply powder expertly. Our ..
Our Premium Foundation Brush is made from the finest synthetic hairs (Badgerlon), and is tapered for.. 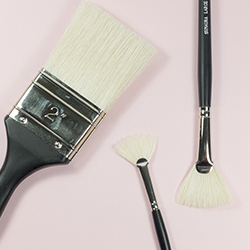 If you've been eyeing up our two Sable Contouring Brushes, then this is the Brush Set for you. It in.. This Slanted Contouring Brush is made from luxury soft Pony Hair, and is slanted for ease of applica.. This gorgeous large Shading Brush is made from Ox Hair, and is slanted for ease of application. Can ..
Our Duo Fibre Brushes are made with both real and synthetic hair. This is the Small size, and is per.. Handmade with the finest synthetic hair-- Badgerlon-- this is a Small Foundation Brush, specially de.. The Graftobian Airbrush Cleaner is ideal for cleaning bottles, tubes and airbrushes after each use w.. This Tool Belt from Kryolan allows easy storage of all your make-up artistry tools and brushes. With.. This is a gorgeous, black, faux-leather brush wallet, capable of holding up to twelve brushes very c.. This black brush wallet is made from a gorgeous faux-leather and can hold up to six brushes comforta.. The Facial Mask Brush is made from nylon and is an ideal size for applying cream masks. Hand glued a.. The large Fan Mask Brush is a stiff fan shaped brush made from stiff nylon for applying masks, gels,.. 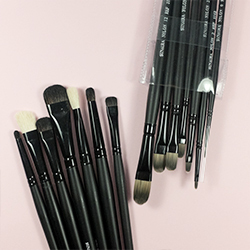 The small Fan Mask Brush is a stiff fan shaped brush made from stiff nylon for applying masks, gels,..
Keep your glue brushes from sticking to your work surface, or keep your make-up brushes elevated wit..